A Quick Guide to buying a suitable memory card for your camera. The majority of entry-level and intermediate range SLR cameras use an SD (Secure Digital) type card. Professional SLRs usually use the CF (Compact Flash) format. To look at they are easily distinguishable because the SDs are smaller, rectangular and have one of the corners cut at an angle, while the CF are larger and almost square. SD: It is the oldest, original format with capacity up to 2 GB. These days they are rarely used. While the capacity is important, the speed of recording is even more important. SD cards are organised into classes, each class ensures a certain minimum recording speed (sequential write speed, more on this later). 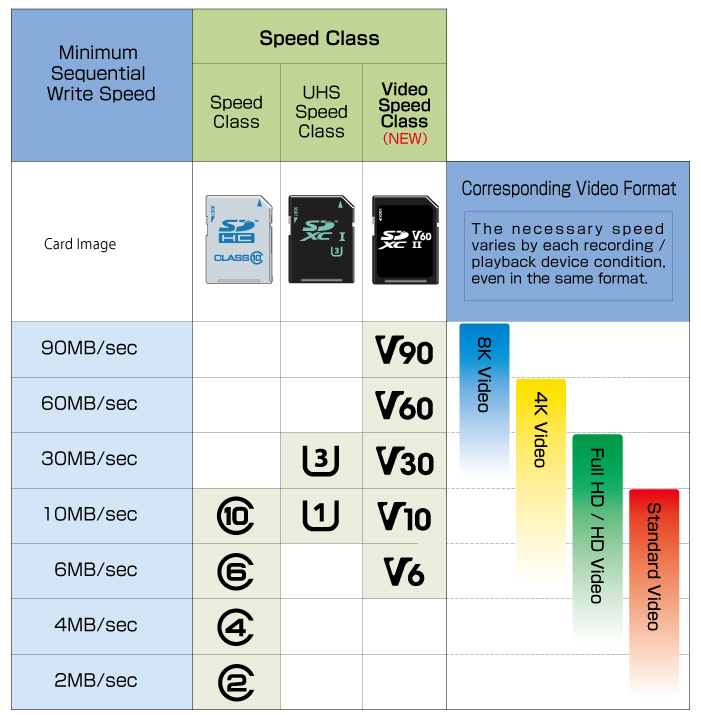 There are currently three different classifying systems: Speed Class (C2 to C10), UH Speed Class (U1 and U3) and the new classes aimed at video Video Speed Class (V6 to V90). They are independent of each other, but for practical purposes, what matters is to know what can work for our camera and what is the most appropriate. The class identifies that cards guaranteed minimum write speed (sequential write ). This means that a U3 (30 MB/s) card is a Class 10 (because there is no class above that classification). In the same way, a V60 (60 MB/s) is both U3 and Class 10. What’s important is that we identify the guaranteed minimum speed. The bottleneck normally occurs during the camera bus’s writing or the SD card write speed. Some cameras use UHS-II (156 MB/s). And the most recent bus type is UHS-III that allows speeds up to 624 MB/s. The type of bus is indicated with Roman numerals (I, II or III) on SD cards and in cameras, it will be shown in the manufacturer’s specifications. For example, for Canon EOS T5i the manufacturer indicates SD, SDHC or SDXC (UHS-I) card. Perhaps it would not be practical to buy a UHS-II card because although it’s compatible with the camera (UHS buses are compatible with all SD cards) we would not be taking advantage of the potential of the card with regard to the writing speed of that camera in particular. In any case, if you have a UHS-II card reader (integrated into the computer or an external USB 3.0 / UHS-II card reader )you are going to notice the reading speed and reduced times of downloading photos and videos. How to interpret the speed indicated on the card? The manufacturer normally indicates the rated speed of your card, e.g. 45 MB/s. This data can be used as a reference, but it is not standardized. Usually, the manufacturer indicates reading speed. The write speed is always lower, and sometimes quite a bit lower. Why do the manufacturers indicate the read-speed and not write-speed?. Because the read-speed is quite stable and gives an idea of the bus transfer rate (communication between card and device). The write speed is not so stable since it also depends on other factors. The sequential write speed may be at the level of the read speed that the manufacturer indicates (it’s usually less but may reach a similar speed). This way of writing is related to large files. The random write speed is linked with small files, that are stored in the free gaps in the storage spaces. This writing mode is usually much slower. Cameras working with very large files, for both photography and video, use the sequential-write mode most of the time. The performance of the card drops gradually as the card fills, for example, due to the fragmentation of the storage space and other internal processes. But this drop in performance is significant only when the card is very full, or if the fragmentation is very large. The fragmentation of the storage space happens when erased files leave gaps. After the time, as we add and erase files, the storage space will seem more a gruyere cheese with many holes and many occupied zones. The writing process becomes slower because the system must look for the first appropriate gap for each new file. Every now and then the card should be formatted to restore the original storage space, eliminate fragmentation and get back to optimum performance. The majority of cameras have the option of formatting within their menus. It’s convenient to do the formatting in the camera since in many cases the camera is responsible for creating files or auxiliary directories that it needs to function properly. Please note that when formatting the SD card the information stored is lost. 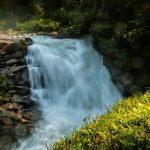 What minimal speed does my camera need? When recording video the camera is responsible for processing and generating a stable data sequence. This volume of information is related to standards or video formats and not to sensor resolution. To give an example, imagine a video encoder typical of a sports camera recording in format 4K to 30fps. These codecs typically generate a bit rate between 30 and 60 Mbps (millions of bits per second). This sequence would correspond to a maximum write speed of 7.5MB / s (1 byte = 8 bits). So in principle, a class 10 SD card (U1 / V10) would do the job. In the case of 4K with SLR / mirrorless cameras, the bit rate may be higher. For example, the Panasonic GH4 has a recording mode with a bit rate of 200Mbps (25MB / s). The maximum specified bit rate for a 4K is about 300Mbps (37.5MB / s). But keep in mind that these large bitrates would only be worthwhile for professional projects that require a very very high quality for post-production. The final video once edited will have a much more compact bit rate and size. Consider that recording at 200Mbps (25MB / s) will generate a file above 15GB (nearer 20GB) for every 10 minutes of recording. To make an estimation of space for your videos you can use a specific calculator, search for ‘video file size calculator’ for examples. For 4K high-quality UHS Class 3 (U3) cards (up to 30MB / sec guaranteed write speed ) And you will have to take into account the size in bytes of the files that will generate during recording. That is, you will need at least 32GB capacity cards to work comfortably. The maximum transfer of information between the camera and the card will occur when we use burst mode in RAW or RAW+JPEG format. This volume of information is going to depend on the resolution of the sensor (megapixels) and the burst speed of the camera (frames per second). The bigger the resolution the more space the RAW file will occupy. 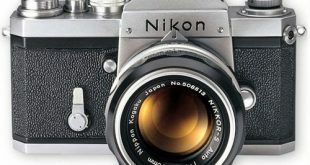 For example in a Nikon D5300, a RAW file would be between 20-24MB. If we shoot in RAW+JPEG mode we would be talking about 25-30MB per shot. The D5300 allows up to 5 photos per second in burst mode (5 fps), that is, in order to maintain that burst for an indefinite time, we would need a writing speed of about .. 125-150MB / s !!! But don’t panic just yet, what happens is that the camera has an internal memory (buffer) where it stores the information from each burst, and the data goes from there to the card, at the speed that the card and the camera bus allow. Normally, we use burst mode for a very short time. Effectively what happens is that the camera will take ‘N’ photos at full speed until the internal buffer reaches maximum capacity, and from there the burst speed (fps) lowers and is limited by the card’s write speed or the transfer speed of the camera bus. It’s always preferable that the write speed of the SD card is superior to the camera bus speed, so as not to form a bottleneck. But as you can imagine, at higher writing speed, more expensive the cards. What brand of Micro SD card should I buy? It is always worth buying branded memory cards that offer a certain guarantee: SanDisk, Lexar, Kingston, Samsung, etc. Buy from a trustworthy vendor. There are many cheap versions. We could easily end up buying a bad quality card disguised as a known brand. SanDisk, one of the main SD card manufacturers estimate that between 20-30% of SD cards sold are false. Personally, I would not buy them through eBay, Chinese stores, Hong Kong… For other accessories, it may be worth the trouble to save a few euro buying in those stores, but in the case of SD cards, it’s not worth the risk, because in the case of failure we could end up losing a lot of important information. It imagines to lose the work of one or several days work on account of trying to save a few euro on the card. Obviously, this depends on the use. Of the number of photos we take per session, the size of the files generated by our camera, whether we use it only for photography or if it is for video as well. In Full HD video recording at 60fps or 4K we will generate very large files. For regular hobby use it’s recommendable to use several smaller capacity cards than only one large capacity card. For example, we can have 2-3 32GB cards instead of one 128GB card. Why? Because if one card gets damaged we reduce the risk of losing one or several sessions worth of work. In any case, it’s essential to pass the photos/videos to the computer as soon as possible and to always have at least one backup of all your information, because devices can fail and when they do, we risk losing everything. The format doesn’t affect the capacity (GB) on the speed (MB/s) of the card. MicroSD cards can be used in every camera (SD) through an adapter, which usually comes with said card. This adapter is a passive element, so it doesn’t affect performance, it simply connects the pins of the microSD card. The only downside I can think of is that the mechanic pins are doubled and, if the adapter is of bad quality, it could give errors on the long run due to overuse, but the card itself would still work correctly and the adapter is practically free. I’ve never had any problems with microSD cards and their adapters. I think that manufacturers tend to go towards the microSD format, because it’s more versatile. If you’re only going use a card with a camera that utilizes SD format (for example, a reflex camera), I would maybe buy a SD card directly, because it’s more comfortable. Due to their small size, MicroSD cards also tend to get lost or misplaced inside backpacks or bags. If you also have a sports camera (most of them use the microSD format), or want to use the card in other devices (tablets, smartphones, etc. ), then the microSD card gives you more flexibility. How do I choose a SD card for my camera? A summary. Check your camera specs to see what type of card it uses: SDHC or SDXC. If your camera is compatible with SDHC, have in mind that it will be limited to 32GB, and that cards with more capacity will surely not work properly. Also check your camera’s bus type (UHS-I, UHS-II…). If you choose a SD card with a bus type greater than your camera’s, it will still work correctly, but you won’t take advantage of the maximum speed of said card. 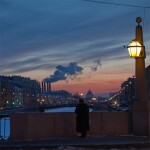 Look for well-known brands and buy only in retail or trustworthy stores. It is better to buy two middle-capacity cards (32GB) than a larger card (64GB/128GB), but it will depend on what will you use them for. SD or microSD? If your camera uses SD format, it can also use a microSD card with an adapter without any problem. A high speed card also saves you a lot of time when downloading photos and videos to your computer, even if your camera limits writing speed. You should think about this when choosing between two cards that are of the same class, but have different reading speeds. Full HD (60fps or more): You would have to check your camera specs, but I would recommend a U3/V30 card. 4K Video 30fps: Depending on the camera’s bitrate, a class 10 card could be enough, but I would pick a U3/V30 card (30MB/s). 4K Video 60fps: 30MB/s card or greater (U3/V30). If you don’t need to take pictures using Burst Mode, you could buy a Class 10 card (U1/V10). Lower class cards are not worth it. If your camera has a bus type that is UHS-II or greater, and you want to take advantage of all that speed (longer bursts), try buying an upper class SD card (U3/V30). Even if your camera works with a UHS-I type bus, it might be better to invest some money on a U3/V30 card. 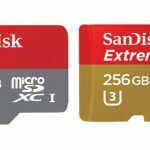 SanDisk cards, differences between Ultra, Extreme, Extreme Pro, etc. Ultra is the basic line. The difference between the speed shown by the manufacturer (reading speed) and the actual writing speed is usually greater. Extreme is the advanced line, which generally offers a better writing performance. There are three variants in this line, sorted by performance and specs: Extreme, Extreme Plus y Extreme Pro. I generally believe that it is worth it to buy SD cards with a writing speed higher than 30 MB/s (U3/V30) For both, photography and video (especially if you use the burst mode) taking into account that many manual cameras have video modes with high bit rates and burst modes that can surpass 10fps shooting in RAW. Modern cameras such as the GoPro (after the Hero+) tend to work without an issue with 64GB SD cards. However, if you have any doubt, you can choose a 32GB card. The majority of these cameras generate a bit rate between 30Mbps and 60Mbps that can support class 10 SD cards, however, it is better to go with a greater margin and I would always choose U3/V30 cards. 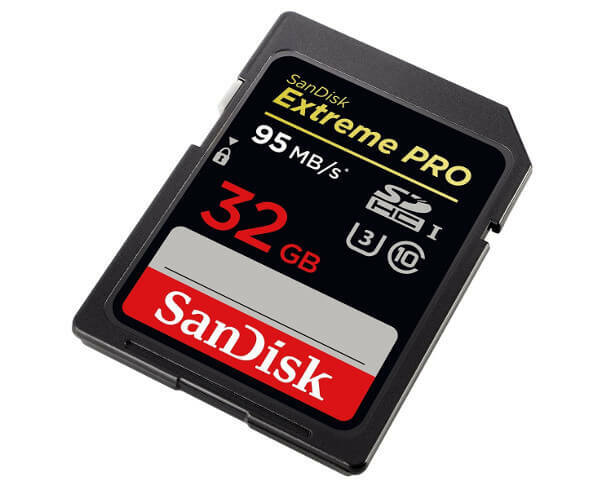 The GoPro for example, recommends cards that have a write speed higher than 30MB/s such as the SanDisk Extreme, Samsung Pro or a Lexar 633x or higher. 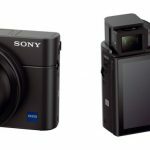 These cards can be used perfectly in cameras that use SD format (DSLR/ mirrorless/compact) using the adapter that tends to come with microSD cards. If there isn’t much of a price difference, I would choose a U3/V30 card, since photography cameras are constantly increasing their buffer speed, especially the mirrorless cameras. For example, for older sports cameras that only record Full HD of 30fps. These cameras tend to generate bit rates of about 30Mbps maximum and a class 10 card should work without a problem. These cards will also cover the interior and they can be used in reflex/mirrorless cameras for photography if you do not need long bursts. Is it worth it to buy an external SD card reader if my computer already includes an SD reader? In general, the answer to that question is yes, it is worth it. The SD reader that is integrated into computers is usually very, very slow. If your computer has USB 3.0 ports (they tend to be identified in the color blue) you will see an improvement in the transfer speed when it comes to downloaded your photos and videos from your SD card. Which technological qualities should your SD card reader include? There are many models that fit these criteria, they work very well and they have a great price range.